​Client: Rose Community Development / Cascadia Behavioral Healthcare, Inc. This project provides 29 special needs units for residents with chronic mental illness. The building is built into a hillside and steps up in a series of terraces. Parking is located underneath the building. Several existing trees on the site were preserved. 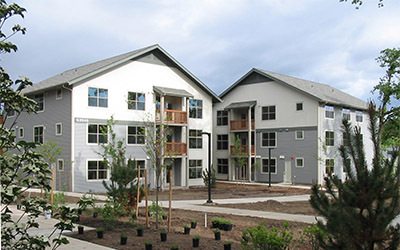 This project has been used by the Portland Development Commission as an example of a housing project that meets their goals of providing residents with a sense of support and community. Park Vista’s 59 apartments are integrated into the neighborhood with a four-story urban building facing a busy arterial street and two smaller three-story buildings located adjacent to a public park. The buildings define a generous courtyard that provides a secure children’s play area with a sunny southern exposure and existing trees preserved to create a park-like atmosphere. ​The Rain Garden is a supportive community housing project. The building includes 29-studio apartments, manager’s suite and office, community living areas, lobby and courtyards. The Rain Garden is designed to be twenty percent more efficient than required by the Oregon Energy Code. Other sustainable design features include: recycled building materials, low-VOC paints and glues, Energy Star lighting and appliances, solar hot water, recirculating high efficiency hot water and throughwall heat pumps. ​Eastgate Station is a 61 unit four-story housing development. Included is a centralized courtyard and play area providing a sense of security and community for tenants. The project is designed to accommodate the needs of families and individuals with disabilities. Approximately 50% of the units are fully accessible. ​Adjacency to light rail transit, frequent bus service along 122nd Avenue and easy access to the Glisan Station shopping center allow for convenient access to basic needs and public transportation. The building provides a density appropriate for the location and draws upon familiar imagery of steep pitched roofs, deep eaves and recessed decks to create a dynamic pedestrian character. 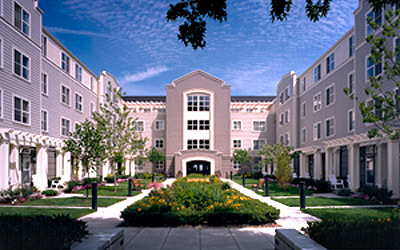 Buckman Heights Apartments provides 144 transit-oriented, affordable and market-rate housing units. The environmentally conscious project uses energy efficient and low emission materials. Run-off water is handled completely on site, much of it flowing into landscaped swales in the courtyard and parking strips. The project received the Governor’s Livability Award, Special Mention, in 1999. ​This project includes 128 units ranging from studios to four bedroom apartments. Eight units are fully accessible and every unit on the ground floor is adaptable for the physically or sensory disabled. Units are for renters earning 30% - 60% of the median area income. One wing of the building is devoted to developmentally disabled tenants. This transit oriented development includes a computer room, a classroom and daycare. 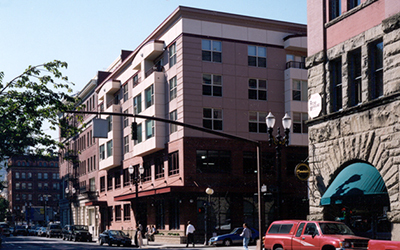 ​The Westshore provides 113 studio apartments for low-income residents in downtown Portland. The existing structure was converted to a parking garage while the 3 stories of housing were designed to be compatible in scale, detail, and color to the surrounding historic offices and hotels. A third level south facing courtyard with views of Portland’s skyline provides quiet outdoor space for building occupants. Bay windows and private decks are reminiscent of historic apartment buildings in the city. ​Ritzdorf Court provides neighborhood retail spaces and 90 affordable apartments for the formerly homeless. 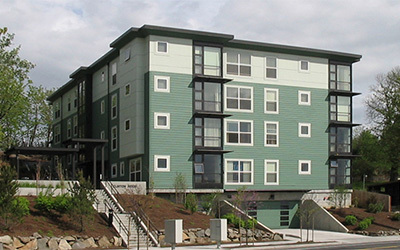 The building presents a 5-story urban facade to the industrial Inner-Eastside neighborhood to the west and steps down to three stories at the Buckman residential neighborhood to the east. A private courtyard serves the residents of the Ritzdorf and a neighboring apartment building. The project is located near several bus lines. ​This 3-story 83 unit senior housing project provides a commercial kitchen, large dining room and lobby as well as recreational facilities. 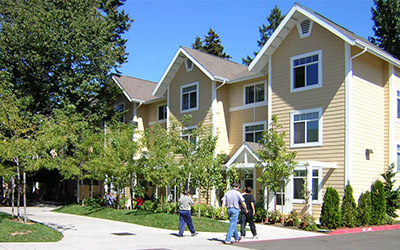 Pearl Court Apartments provides 199 units of affordable housing on a full city block in Portland’s River District. The “O” shaped building encloses a large courtyard. Entrances are responsive to the district’s pedestrian and transit patterns. The main entrance on the north is located adjacent to a public pedestrian walkway and the west entrance is adjacent to the Portland Streetcar line and Jamison Park. The building was the first to be built under Portland’s five-story wood-frame ordinance. 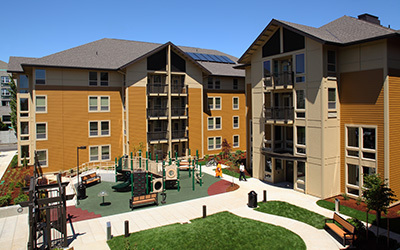 Munsel Lake Village is a 45 unit affordable housing project contained in two three-story buildings connected by a circulation core. Design considerations include a high-performance envelope to withstand the Oregon coastal climate.